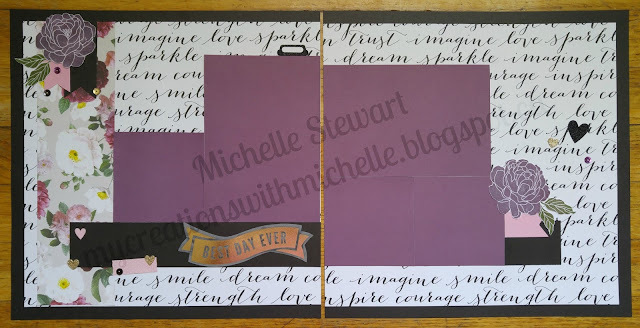 I am totally loving the versatility of the Live Beautifully collection, and anytime I get to head into my craftroom to create I am pulling out this paper. Our company has challenged us to create heritage style layouts. So I decided to use a photo of my grandmother and the women in her family. 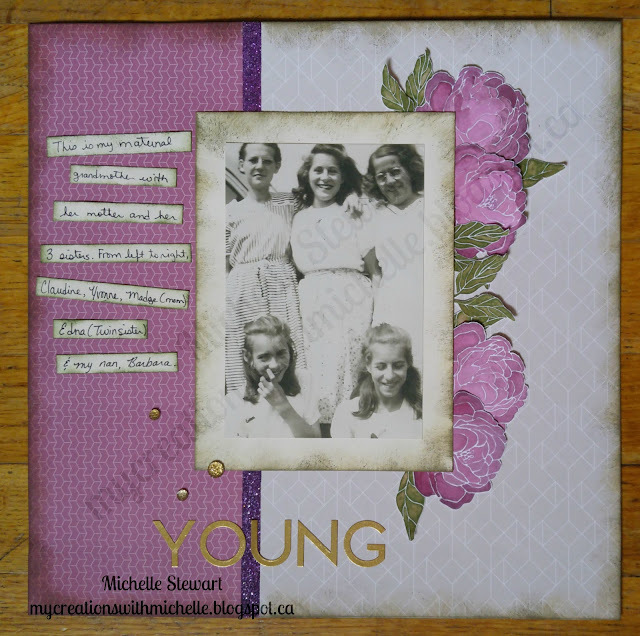 I distressed the mat and the papers used for this layout to give them that aged look. I had some alphabet stickers left over from the Welcome Home Wreath kit, so decided to use those for my title. My grandmother's maiden name was Young, and so I thought that was fitting for my title. My grandmother is on the bottom, along side her twin sister. My Great Grandmother is directly above her. I've been asked how I created my flowers since they have a water color appearance. I've shared a video that my daughter helped me with(it's my first technique shared video, so I'm sorry for the quality). Thanks for stopping by and I hope I was able to teach you a new technique. Hey all! 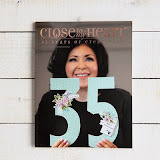 I'm so excited to be sharing this with you, today I'm the featured guest designer over at Creative Scrapbooker Magazine Blog. Make sure you head over and check things out! If you are interested in receiving a new Seasonal Expressions catalog, which is live May 1st, contact your local consultant, or if you don't have a consultant, contact me! I'd be happy to be your CTMH consultant. 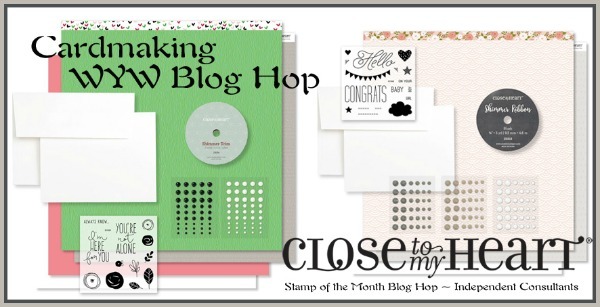 Welcome to our April Blog Hop featuring the ShinHan Alcohol Markers. We have 24 colours available, plus a blending marker. If you've arrived from Nancy's Blog then you are in the right place! However, if I am your first stop on this Blog Hop across Canada, then you are in luck, because I am the first consultant when hopping East to West. 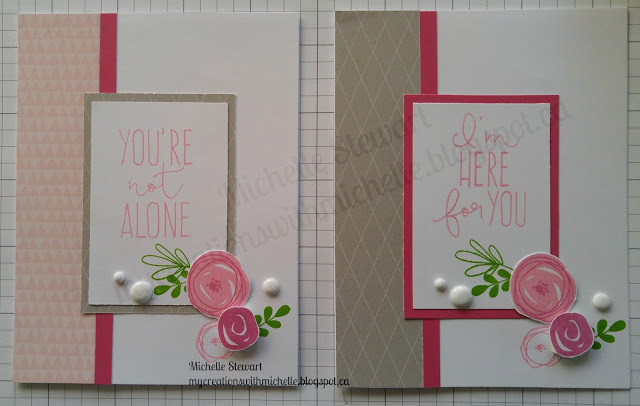 For my first card, I used Pixie cardstock along with Sugar Rush pattern paper. 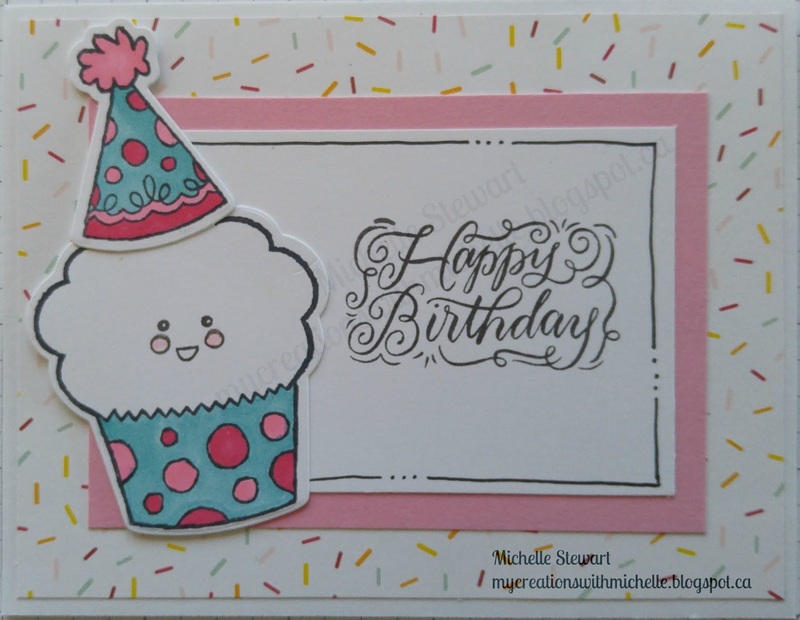 The stamp set I used for this card is Sweet Birthday and it's one of my favorite go to stamp sets when creating kids birthday cards. For the sprinkles I stamped those using Lagoon and Blossom Ink. I used Golden Yellow, Turquoise Blue,Cherry Pink and Tender Pink. Now I prefer to use Memento Black Ink when colouring with the ShinHan Touch Twin Markers. I let the image dry for about 20 minutes before colouring to make sure I don't get any bleeding. 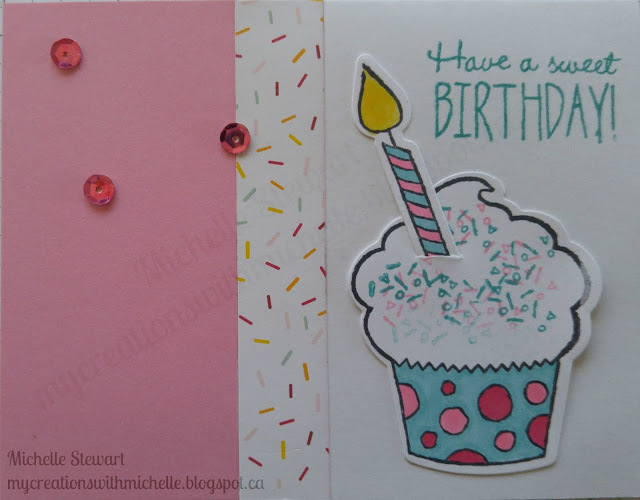 Now for my next card, I used all the same products, then added the sentiment from Birthday Sparkles and did some doodling to finish off the card. Love how this one turned out. The next 2 cards were so much fun to create. I used the stamp Safari Ballet, as I was inspired by the birth of April's baby( April the giraffe had her baby today, it was a boy). 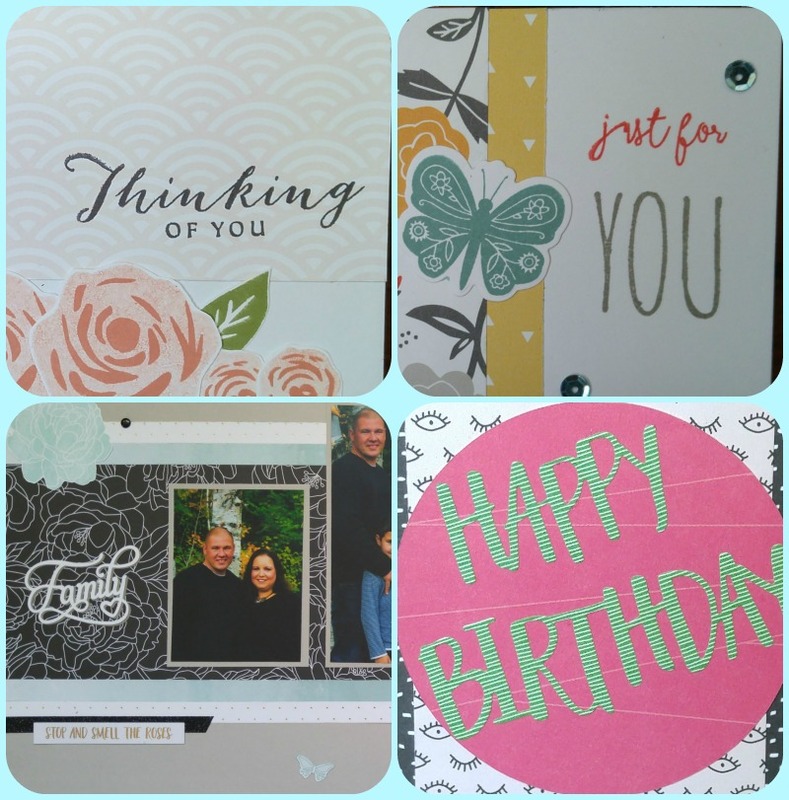 I used Some Kind Wonderful paper layered ontop of Pacifica cardstock. I added some White Shimmer Trim(love this stuff). 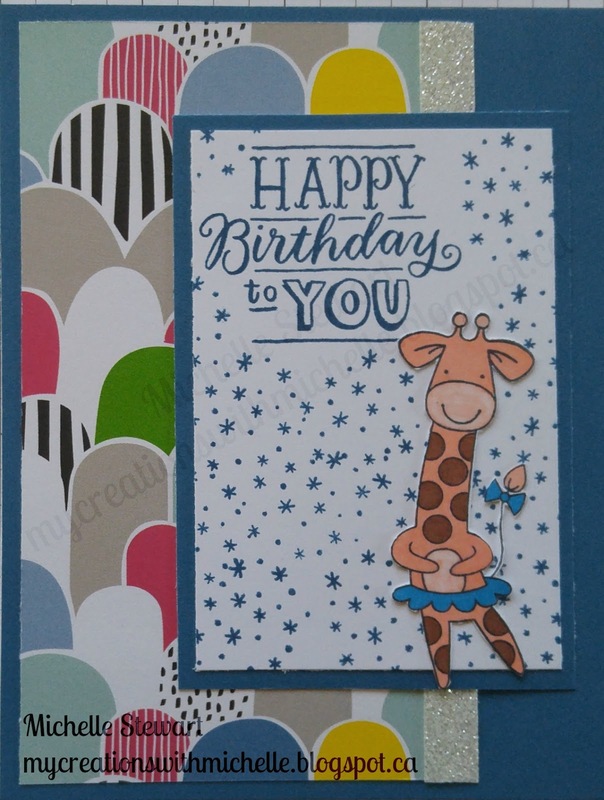 Again I used the Birthday Sparkles stamp set for the sentiment, and also used the sparkles to create a background for the cute giraffe in the tutu. I used Clay and Light Orange ShinHan Markers blending with the Colourless Blender Marker. The Blue is Peacock Blue as my other blue has missing.....opps! 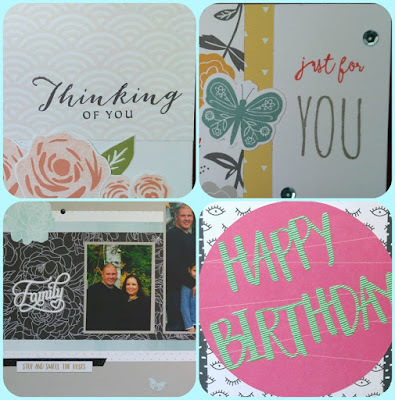 My last card, is also using Some Kinda Wonderful paper, and I used Willow cardstock and Black Shimmer Trim. 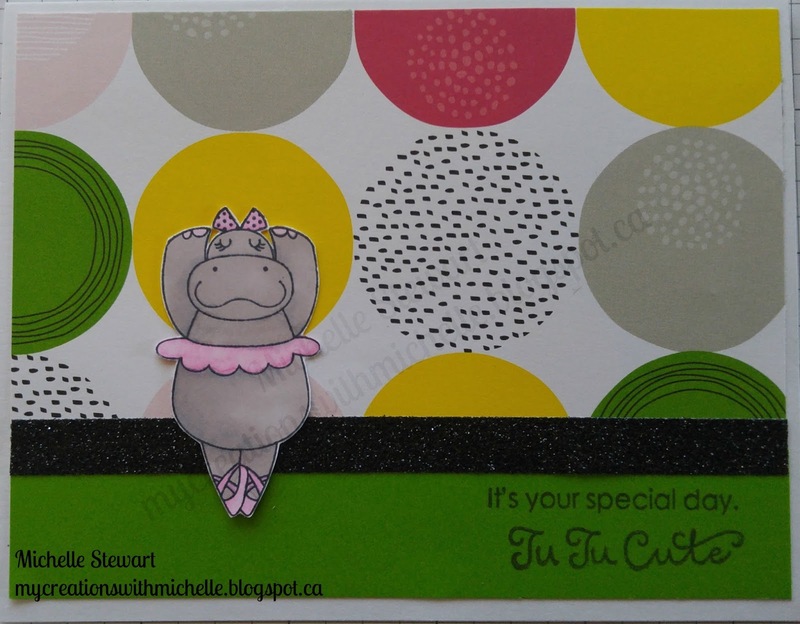 For this super cute hippo I used the Warm Grey and the Colourless Blending Marker to create the lighter shades. 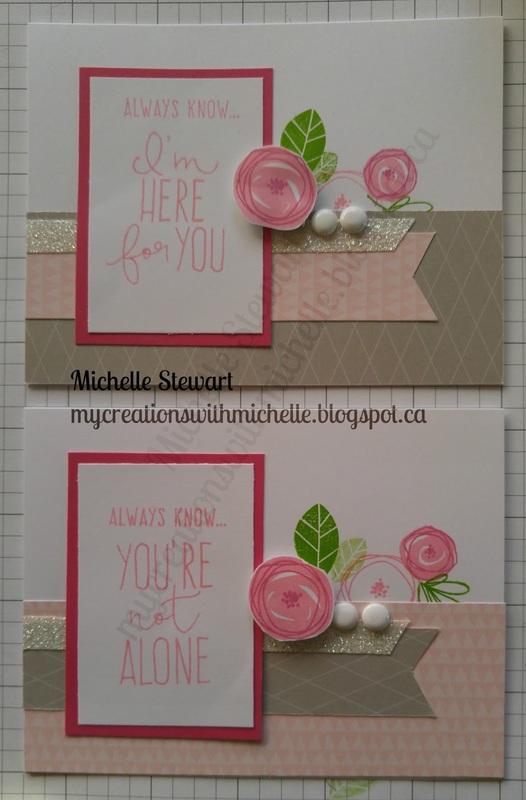 The sentiment is stamped directly onto the Willow cardstock in Black. The bow, tutu and ballet slippers are Tender Pink and Colourless Blending Pen to create that lighter shade. Your next stop on the Cross Canada Hop is Pam from Newfie-Scrapper. If you get lost along the way, you can head right back here, as I have the whole list provided for you. Thanks for hopping along with us - we hope we were able to inspire you to get creative using some of the designs, products and techniques seen along the way. 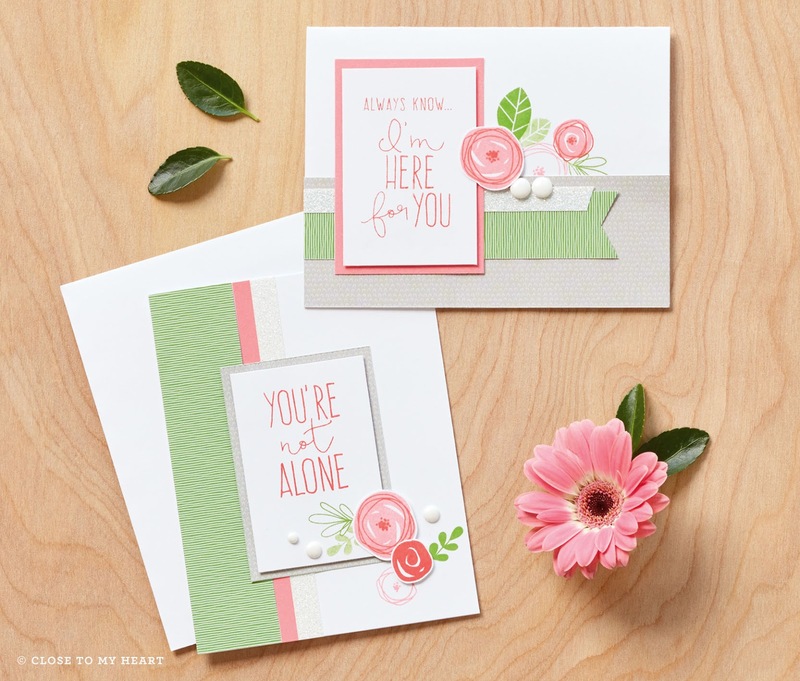 We hope you will join us again next month when we will be featuring creations using our favorite NEW paper collection, yes that is right, we have new paper collections coming. So mark May 15th on your calendars and hop along with us. I just can't get enough of this gorgeous paper collection. The colors and patterns are very on trend, and there is just so much you can create with them. There are 16 beautifully designed papers in this collection. For my second layout I used the word Dream and stamped it in 2nd generation all over my base pages. I used the gold embossed dots, pink shimmer trim, the pink watercolor paper to create the bottom portion of the page. 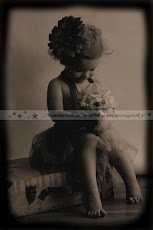 The bold flower print is the mats for the photos, and then I added the black and white striped paper for some pop! The flowers were created the using the same technique as my previous layout, but added some shimmer with the Shimmer Brush. To finish off the layout I added gold sequins and the zipstrips with the gold embossed stripes. For my third layout, I started with black base pages. I added the scripted pattern paper as my background. I choose to pull the purple from the flower pattern as my accent color, and my closest color choice was Eggplant. My flowers are also stamped in the stamp color. I added some compliments from You & Me and Good Life. I colored in some sequins using purple and black markers to coordinate with the layout. I still have 9 full sheets of pattern paper to create with out of my package, and lots of partial pieces. 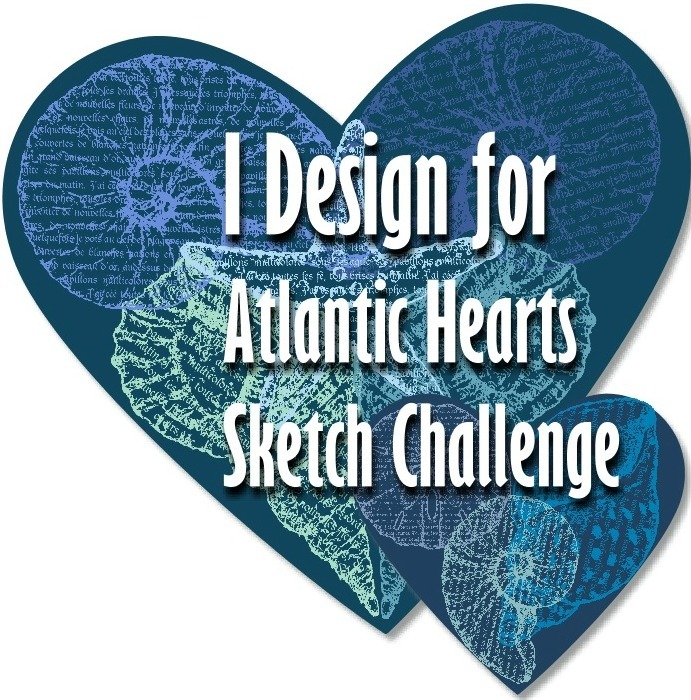 Make sure you come back to see what I create next using these stunning patterns. 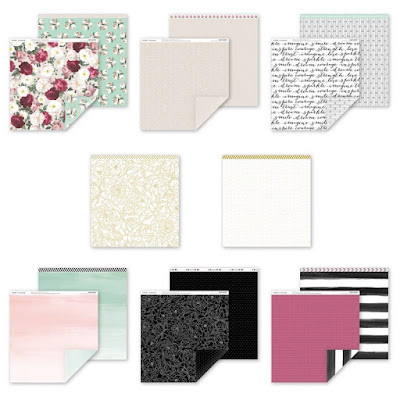 National Scrapbooking Month is just around the corner, and we have a Beautiful Promotion for you. 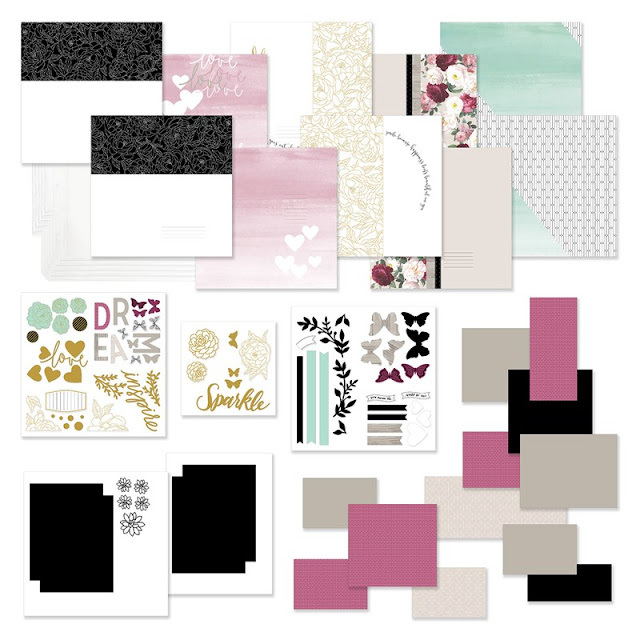 This year’s National Scrapbooking Month campaign will feature the Live Beautifully paper packet and stamp set, designed to celebrate your beautiful life. This exclusive paper packet and stamp set will be available for purchase outright, with no qualifying purchase required. 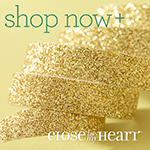 Celebrate your beautiful life with this limited time collection! Your life is full of everyday beauty that deserves to be remembered. 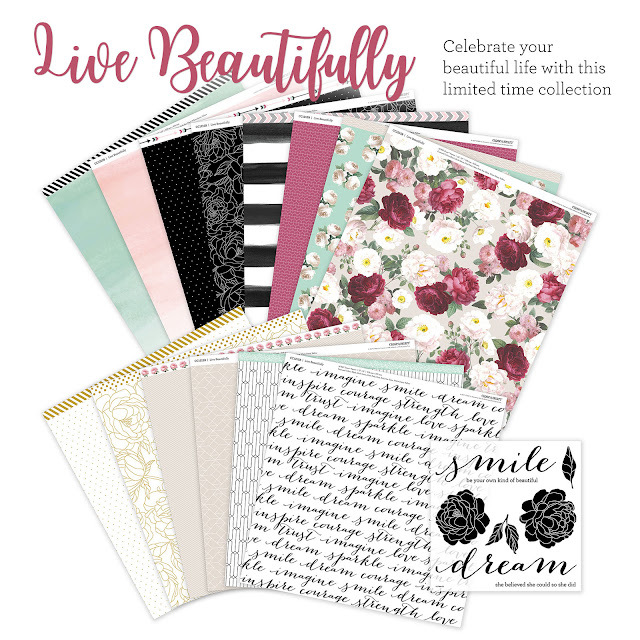 This National Scrapbooking Month, celebrate the beauty of your life with our exclusive, Live Beautifully paper packet and stamp set. Featuring rich floral patterns, gold foil designs, and more, this paper collection is only available for a limited time. Order yours, starting May 1st and start preserving your memories today. 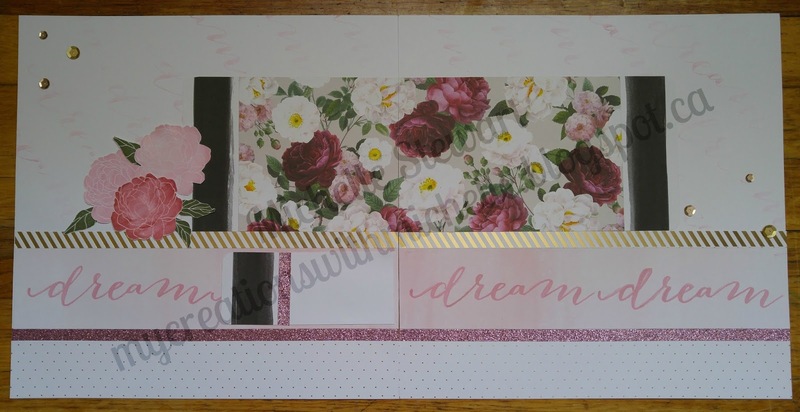 I've been busy creating using this paper and stamp set, and today I'm going to share with you the 1st layout I've created using this stunning paper and coordinating stamp. I stamped the flowers in Pixie Ink, and using both Pixie and Pomegranate Inks and my waterbrush I painted more ink onto the stamped flowers blending the 2 colors to create the beautifully flowers. 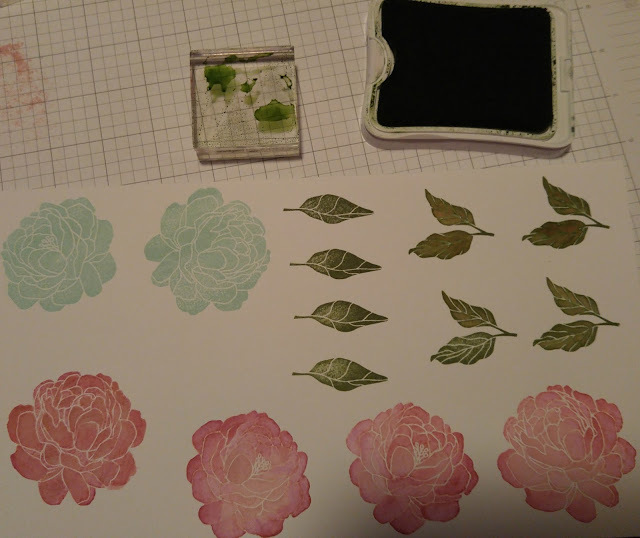 Usint the stamp technique I've also painted the leaves using New England Ivy Ink. 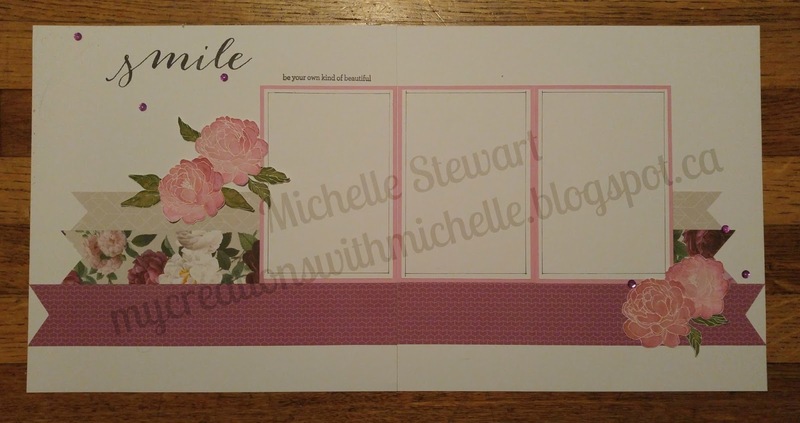 Staying in the same color, the mats for the photos are Pixie cardstock. The sentiment is stamped in Black Ink, and then I colored the silver sequins using pink and purple markers to coordinate with the colors in the paper. We have used these paper and stamp designs to design an exclusive set of Cut Above™ layouts that are designed to make preserving memories faster, simpler, and easier than ever. A new, easy way to preserve your memories! 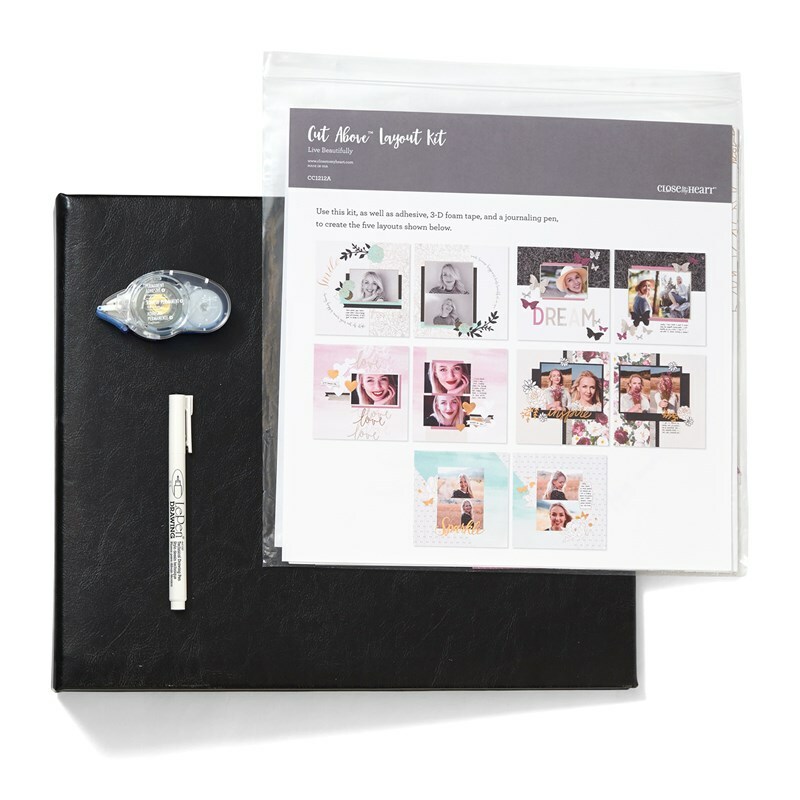 This National Scrapbooking Month, we’re offering you a new, easy way to make coordinating layouts to preserve your memories. 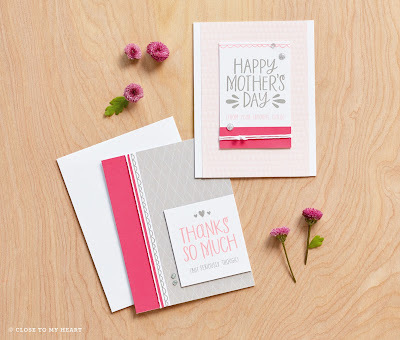 The Live Beautifully Cut Above™ layout kit comes with everything you need to create five two-page layouts. With pre-printed base pages, die-cut paper pieces, stickers, and gold foil accents, this kit will help you preserve the moments that matter most in practically no time at all. This kit is only available during May, while supplies last. Buy the layout kit alone or get a discount by buying it as part of an album bundle.